Easter is quickly approaching, so right here I have the first of the Easter chocolates I'll be covering (I don't expect to do many because most Easter chocolate is the kind of chocolate I don't cover anymore, but hopefully I'll get at least one more). 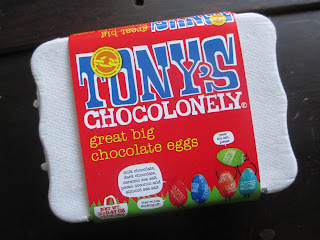 This set of chocolate eggs comes from Tony's Chocolonely, a company I discovered before at World Market. This set, however, I found at Natural Grocers. Natural Grocers doesn't kid around with the kinds of products they're willing to sell, so you can count on them to have one or two products like this for each holiday (sometimes they do sell out of them a little early, though, since I think they like to avoid wastefully overstocking). The style here falls into the casual category. A label wraps around a small egg carton housing a dozen chocolate eggs. 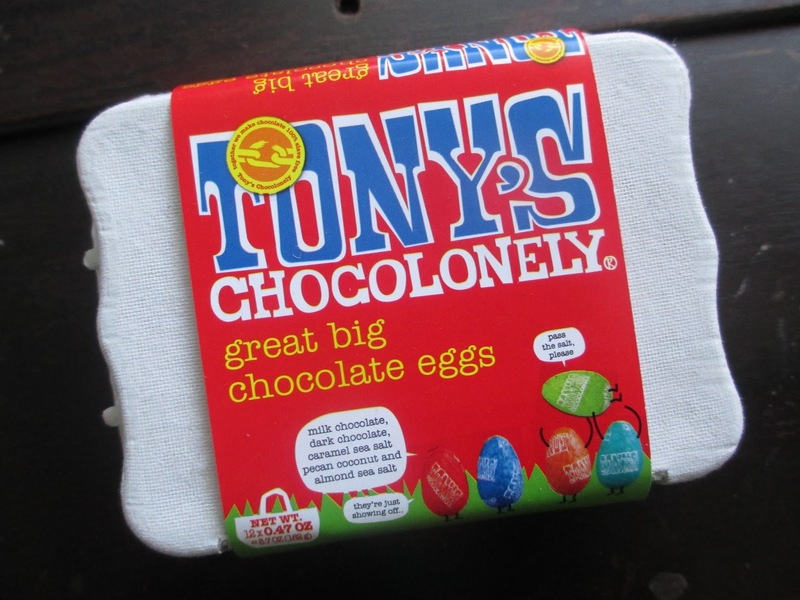 Now, even though the label calls them "great big chocolate eggs," these are not big. They're quite small. So I don't know if the label is meant as a joke or if they're just describing them as being "big" as in greatly wonderful. They do look cute: a dozen colorful chocolate eggs wrapped up. As someone who is no longer used to buying Easter chocolate, it's exciting to actually have a silly chocolate product like this that I can get behind. Because, of course, you'll recall that the main objective from Tony's is 100% slave-free chocolate. The inside of the label states: "Alone we make slave free chocolate, together we make all chocolate 100% slave free. So we ask you to join." Amen to that, eh? Easter's the perfect time, too, to start thinking about the products that we support on a regular basis. I'm not trying to make you feel guilty about getting a chocolate Easter bunny; I just like to remind people to choose ethically sourced chocolate products more often than not until they eventually become all that you want to buy. So. What kind of chocolates do we have inside of this carton, besides colorfully-wrapped ones? They come in five flavors: milk chocolate (red), dark chocolate (blue), milk chocolate caramel sea salt (orange), dark chocolate pecan coconut (turquoise), and dark chocolate almond sea salt (green). Some of these I have commented on before in other reviews of Tony's. I personally prefer their milk chocolate to their dark chocolate: both are sweet, which to me makes more sense for milk than dark. The milk chocolate caramel sea salt, as I've mentioned, has almost more of toffee pieces in it--which seems to work better for this egg shape than for the chocolate bar. The coconut isn't strong in the dark chocolate pecan coconut, and the pecan pieces are small; they're just light flavor/texture additions. And the dark chocolate almond sea salt likewise has small pieces of almonds that only add a little bit of flavor/texture; the salt almost adds more. Of course, the fact that all of this chocolate is sweet and even the fact that the flavored chocolates aren't strongly flavored means that it's perfect for a set like this. The look is casual. 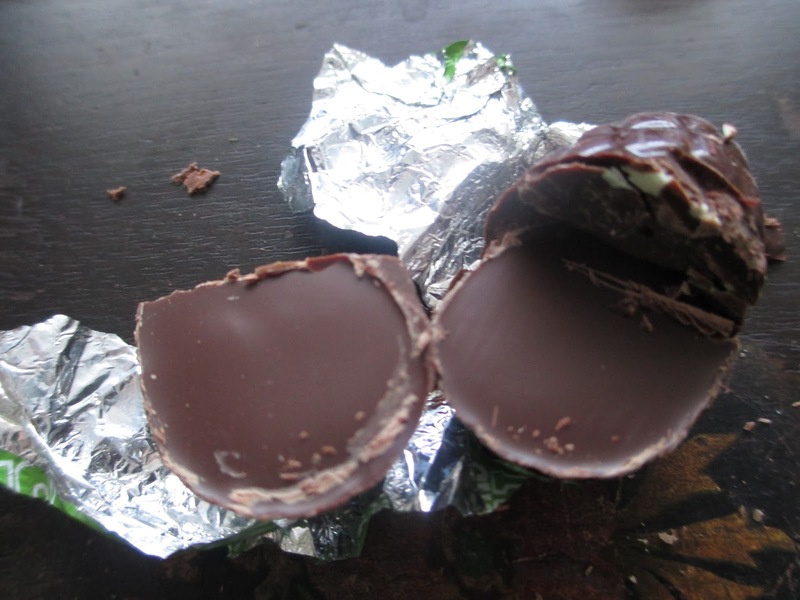 And these chocolate eggs can be enjoyed by both children and adults. You can set them out as part of an Easter display or give them as a gift. You can even remove the label easily and add a little card on top to personalize the carton. This set makes a great option for choosing ethically sourced chocolate this Easter.